Now, I may not be the biggest fan of the more commercial side of Valentine’s Day, I do rather like the colour palette that comes with it. As someone who wears red lips and nails quite often, the shops rolling out lots of these tones isn’t something to be snarled at. 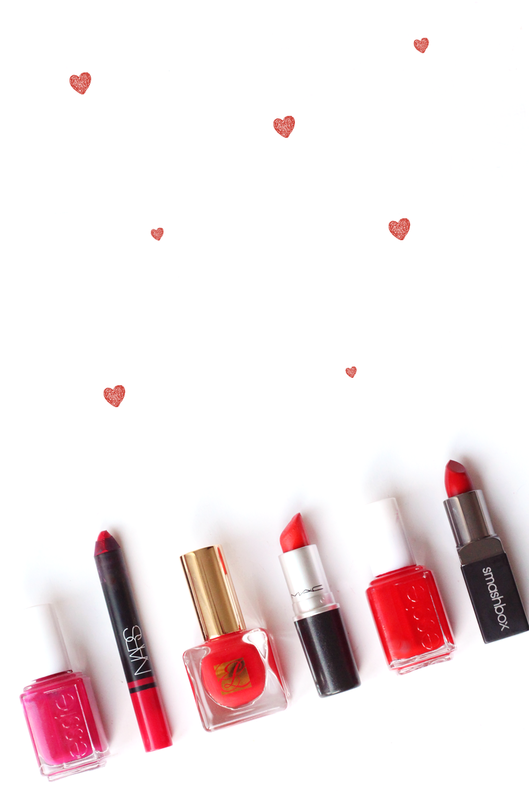 So, I thought I’d round up my favourite shades to see you through your Valentine’s Day and beyond. First is an orange-red option, as it flatters a lot of skintones and the shade is a beautiful one. For lips I went for the classic MAC Lady Danger, which has been a long-term favourite of mine now. It’s a beautiful bold shade, but with it being more on the matte side, it stays put so you won’t have to top it up too often! Matched with this is the gorgeous Estee Lauder Pure Colour Nail Lacquer in Envious (seen on here), it makes for the perfect fiery combo. For the pink lovers amongst us, I’ve picked two bright and vibrant shades from the spectrum. NARS Satin Lip Pencil in Luxembourg is one of the most amazing blue-toned hot pinks I’ve ever tried. When I want a bold pink lip, this is always the one I choose! Essie Nail Polish in Raspberry matches this perfectly as, although it isn’t as in-your-face as the lip option, it makes for a gorgeous errr raspberry shade which looks beautiful on the nails! Finally, you have to have a true red for Valentine’s Day and I wouldn’t be without a whole host of reds in my collection. The gorgeous Smashbox Be Legendary Lipstick in True Red is such a good shade, as I can imagine it would suit a lot of skintones with it sitting in the middle of cool and warm toned. The formula is great too, as it’s long lasting (perfect for smooching, obv). Finally, my favourite red nail polish of all time, the beautiful Essie Aperitif. I wouldn’t not have this in my collection as it’s the perfect bold red without being too bright, just the perfect cherry tone. Gorgeous! What shades do you like wearing on Valentine’s day? Let me know!